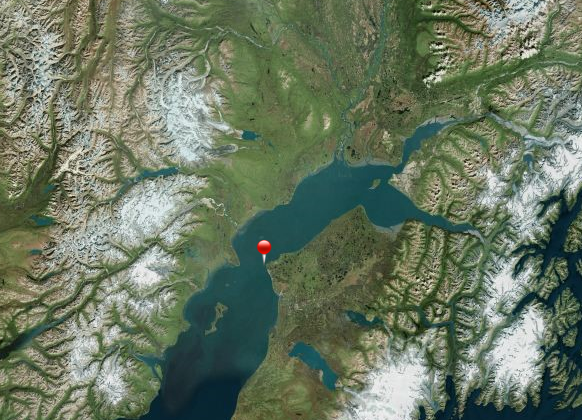 A natural gas leak in Cook Inlet has finally been repaired, more than three months after it began. The oil and gas company Hilcorp said a dive team managed to install a clamp on its pipeline late Thursday night, after a week of work and 12 dives. The leak, in a line near Nikiski, was discovered in early February, though federal regulators say it probably began in December. Divers couldn’t get down to repair the line for weeks after the discovery, because of winter sea ice conditions in the Inlet. In a press release today, Hilcorp said the culprit was a small hole in the bottom of the pipeline, where it was resting on a boulder on the sea floor. The company said divers will inspect the rest of the gas line and a nearby oil pipeline in the coming days. The company has shut down two other pipelines in Cook Inlet in recent weeks, after suspected oil and gas leaks. State regulators say an oil sheen near Hilcorp’s Anna drilling platform did not come from a pipeline, but instead likely came from the platform itself. Hilcorp is still investigating whether there may be a leak in a natural gas line from its Steelhead platform. The string of incidents has drawn scrutiny from both regulators and environmentalists. The state Department of Environmental Conservation and federal regulators plan to conduct a review of oil and gas infrastructure in Cook Inlet, much of which dates back to the 1960s. And some conservation groups are raising concerns about a new project Hilcorp is advancing in the Arctic Ocean. They say the company’s inability to respond to a problem in Cook Inlet, within easy reach of the state’s major population centers, calls into question whether the company can operate safely in the far more remote Beaufort Sea.